Moringa MD is also one of the best weight loss supplements that we have reviewed, not just because of its ability to help a person lose weight in a healthy way, but also because it provides antioxidants to the body as well. The key factor to losing weight is to burn the fat, and with this supplement even if fat is burned, the hunger pangs are suppressed and you won’t feel the need to do a cheat day just to fill your hunger pangs because there is absolutely none! You can enjoy eating just the right amount of carbs and calories per meal without the worry of going hungry. Moringa Oleifera – this is a plant that commonly grows in the tropics and in sub-Himalayan parts of countries such as India and Pakistan. This plant has been used to treat a variety of medical conditions already, and as such is also used for patients who want to lose weight effectively and safely. Aside from working as a treatment for many medical conditions, moringa oleifera also works as an antioxidant, acting to protect the cells of our body from potential damage. This supplement comes in the form of capsules which are taken orally. For adults, the recommended dose is two capsules per day. It is best taken once in the morning and another one in the evening. It has not been specified whether it is best taken before or after meals, which means you can go with whichever you are comfortable with. Also, may you be reminded that you can also take two capsules together if preferred. Also, pregnant women, nursing women and children under the age of 18 are all advised to go to their doctor first before deciding to take this supplement so that they will know whether it is safe to take or not. We also want to remind the consumers that they should not exceed the recommended dose to avoid problems. The current price for 1 bottle is $49.95. The manufacturer also offers a variety of packages to those who want to order more than 1 bottle. Starter package: 2 bottles cost $34.95/each. Intermediate package: 2 bottles + 2 free costs $27.95/each. Best value package: contains 3 bottles + 3 more free costs $23.30/each. These prices have already been discounted. As of now, they have not yet offered a monthly subscription basis. This product comes along with a 60-day money-back guarantee. This product is also manufactured in an FDA registered laboratory and also has a certification from cGMP. The main active ingredient that is moringa oleifera has also undergone studies to prove its effectiveness and potency. We have already reviewed a lot of weight loss supplements that have different attributes and work in different ways. Moringa oleifera does not only target the systems that is concerned with producing body fat, the hunger pangs, and how hunger itself is actually suppressed, but it also helps the body to become protected with the help of antioxidants. Their money-back guarantee ensures its consumers that they can have a refund if desired results are not met. The testimonials from the consumers that have used this product are all very positive. Click here to discover our top rated weight loss treatment products. 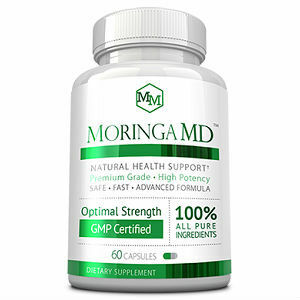 Michael Hall	reviewed Moringa MD	on May 1st	 and gave it a rating of 5.